Patriots Park Lodge may or may not be visible from the road, depending on foliage. 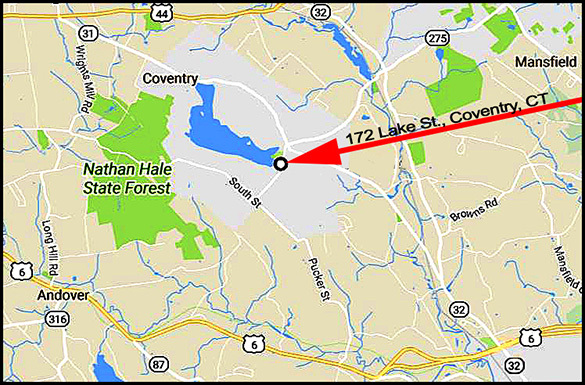 Patriots Park Lodge is located at 172 Lake St., opposite High St. and a flagpole, in Coventry, CT. See directions below or get directions from where you are here. Ample free parking is available in front of the lodge. Take Rt-44 to Rt-31 South. (Look for a gas station, Walgreens and Key Bank at the intersection). Drive 4.1 miles to a blinking light. Turn right at the blinking light onto Lake St. (Rt- 275 is on the left). This intersection has a gas station, post office, and Subway restaurant. 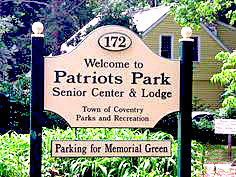 Drive .3 miles and look for the Patriots Park sign (see photo) on the right. Take Rt- 32 north to Rt-31. Turn left onto Rt- 31 (at the drive-in theater). Drive 3.2 miles to a blinking light. Turn left at the blinking light onto Lake St. (Rt- 275 is on the right). This intersection has a gas station, post office and Subway restaurant.